I quit sugar in May 2012. I did this to try and clear my face of cystic acne which was really bad at that time. I had bumps on my forehead that did not heal for about 6 months. Even medical treatments could not fix them. When my acne cleared after quitting sugar, thrilled I continued to look around on the internet on why my acne cleared with this diet change. The video below was shared with me by my husband. While the video is quite long it gave me a deep insight into the damaging effects of refined sugar. Tasty and addictive, it can do some serious damage to the human body. My experience with quitting sugar and the wonders it worked for my skin was the first article I wrote which was published on MindBodyGreen. At the time I did not have a site. I just wanted to share my experience with other people who were struggling with acne. I had a twitter handle which was linked to the article. While most women contacted me to ask for more information, I got some comments saying that people have been eating sugar for 1000’s of years and why suddenly it was such a big problem. While sugarcane has been consumed by humans for centuries and the process of crystallisation of sugar cane juice to get sugar was known to man, it involved boiling the sugar cane juice till it crystallised. This was a tedious process and no one was doing it all the time. Sugar was also expensive and not everyone could afford it. Today sugar is available freely and is very cheap. It is added to almost every product like bread, pizza sauces, drinks etc. It is almost difficult to avoid sugar. Then there is high fructose corn syrup which is added to processed foods. What I find little unsettling is the reactions I get from people when I tell a person to quit either sugar or dairy to clear their skin. The reaction always comes from people who do not have acne. I am very active on Quora where I share what works for my acne and tell people what to avoid to get rid of their acne. I get comments asking me where the scientific studies are and if I can share the link to the research papers that prove there is a link between diet and acne. A little note about me – I am not a researcher neither do I have a lab where I do studies. My site exists to help people who suffer from acne. I do not force people to visit my site. Neither do I force people to quit any food. If I had waited for scientific studies to cure my acne I would have been a mental wreck by now as I would still have had acne. It was because no one could cure my acne that I started to find out ways I could do this on my own. And because I know first hand the devastation acne can cause I try to help other people who struggle with acne like I did. Now enough of my personal story. So what exactly happens when you eat excess sugar. Below is a snippet from this link. The “burst of inflammation” described above is what can make your acne worse or make you start getting acne. Now not everyone who eats excess sugar will get acne, as we well know. Unfortunately, for some of us excess sugar may cause acne. This could also be why your acne which started out as teenage acne continues well into adulthood because your inflammation levels kept getting worse. Or you start getting acne for the first time in your 20’s or 30’s for the same reason. When I quit sugar it was sheer hell for the first 2 weeks as I went through withdrawal symptoms. I had headaches, muscle aches and other weird symptoms I could not explain. Worst were the cravings I had to eat something sweet. I actually wanted to forget it all and eat cake. I have a big sweet tooth and this was absolute torture for me. The only thing that helped was the fact that it may help clear my acne and at this point after fighting acne for 20 years I was pretty much ready to do anything to get my skin to heal. 2 weeks passed where I somehow managed to avoid all sugar, except for the teaspoon in my tea. Now let me paint a little picture for you with my before and after experience. Before I quit sugar I always woke up with 2-3 new breakouts. These breakouts would generally stay on my face for 3-4 weeks and this is if I was being optimistic. There were times when my acne would not heal for months. My face would be red and inflamed and it would get worse throughout the day. Sun exposure made my skin red. My face would be swollen. It looked like a war had taken place on my face during the night. After I quit sugar I woke up with a face that looked healthy. It no longer looked like I had a bad inflamed rash. My old acne healed in 2 weeks tops. The redness on my face gradually became less, the less sugar I ate. There were other overall changes to my health and my body. I felt healthier and lighter. I did not feel sleepy during the day. You can quit sugar cold turkey, i.e give it all up on day one. Or you could start gradually by not eating one thing sweet that you normally eat. If you normally eat a doughnut for breakfast you need to find something to replace it with. It can be anything from a chicken or cheese sandwich or a bagel with cheese or even a slice of pizza. At this stage do not attempt to replace it all with healthy foods. Anything that is not sweet. Do not try and replace all your sweet snacks initially. The list of symptoms you may have are headaches, muscles aches, irritability, feeling sleepy or sluggish, mood swings or something that is totally unique to you. You may even have flu like symptoms. Some people even get tremors or experience trembling hands. Remember this is your body trying to get used to the lack of sugar. When starting out with quitting sugar do not try and replace all your sugary treats with healthy stuff. If you are sure you can cope with it by all means go ahead. But from experience trying to quit sugar and replace your sugary treats with salads is a recipe for disaster. Be kind to yourself. You’ve already taken away the sweet stuff. Do not take away everything in a day. You can replace it with chips, pizza, sandwiches with savoury fillings, crackers and cheese, yogurt , pita with hummus, dry fruits, nuts, pies with savoury fillings, basically anything that is not sweet. As your body starts getting used to the lack of sugar you can replace some of the unhealthy replacements above with healthy snacks. Healthy fats will help with the cravings. Healthy fats are avocados, nuts, nut butters like almond or peanut butter, salmon, tuna, olive oil or eggs. You can have a teaspoon of sugar in your tea or coffee. Watch a funny movie or read a good book. Stock up on movies and books to get you through this time. Go for a walk or exercise. It helps a lot. To beat cravings for sugar you can eat some fat like peanut butter or nuts. Another way to get rid of a craving is to brush your teeth. You can eat fruit to beat your sugar cravings. Please sticks to 2-3 fruits a day and no more. 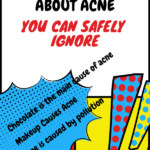 I feel it is very important for me to say this, as I get a lot of questions from people asking me why they have acne caused by sugar when their friend or sister who eats more sugar than they do, does not have acne. This is something unique to the human body I am not qualified to explain. Your body reacts a little differently to sugar than your sister or friend. However that does not matter. If you have tried everything thing and your acne has not healed might be time to give this a try. Here are links to some articles you can read on the topic of sugar and its negative effects on the human body. I agree sugar have lots of side effects recently I am trying to get rid of it because of increasing in weight, I have even reduced intake of tea and your article just helped me in how to properly get rid of it, Thanks for sharing..
Hi Saeed. Glad to hear it helped you. Good luck. I’ve tried quitting 3 times and failed every time when I got my period. Because hormonal cravings are just the devil. Now I’m in week 2 again and trying to pull through. I have to say that I’ve been on a meat-, grain- and dairy-free diet for years now, my only problem has always been sugar. When I stop eating it, the change is incredible. My skin clears up, I sleep way better, I have more energy and feel less depressed and more motivated. I hope I can do it this time and not just for a couple of weeks. It is crazy how addictive that stuff is. I know exactly what you mean. Hope you can pull it off this time. However if you stay clear of sugar for about 8 weeks, those cravings go away as well. Maybe I’ll do a post on dealing with cravings.